When you’re looking for a spotting scope and you know the industry, you’re probably familiar with Leupold. Perhaps you’d love to purchase a Leupold spotting scope, but are hesitant to lay out that kind of cash. If that describes you, there’s another name you should familiarize yourself with: Redfield. Redfield is actually a child company of Leupold, which should bear well for being able to purchase high-quality optics at a more budget-friendly price. Let’s see if that holds true. How Good Is The Smaller Redfield Rampage? If your budget is quite constrained, the Redfield Rampage 20–60x60mm spotting scope should suit your needs nicely. This 20X to 60X glass features an excellent field of view, bright and crisp images, and a housing that is nearly bulletproof. The only downside to this model is a very slight amount of image shift when you zoom all the way to the maximum magnification. That image shift is minor and doesn’t really affect the usability of the optic. What Can I Expect From The Larger Redfield Rampage? Slightly larger with an 80mm objective lens, this model features the same magnification range as its little brother. This Rampage offers fantastic image quality, a waterproof and fogproof design, and it comes with a view-through carrying case. The drawbacks are a lack of fine focus control, limited range of motion when the view-through case is used, and a substandard included tripod. Surprisingly, the field of view is also a bit smaller with this model: 52 to 105 feet compared to 51 to 114 feet. Which Features Are Common To The Lineup? Both models of the Rampage offer the same eye relief through the straight eyepiece: a somewhat limited 14mm to 17mm. Redfield utilizes BaK–4 prisms in a porro prism design, with phase correction coating to ensure unmatched image clarity and resolution. Both models feature a retractable sunshade to reduce glare and increase visibility when spotting in wide-open spaces, and each is built in a polycarbonate body, the same stuff used in bulletproof glass. Every Redfield Rampage comes with a tripod, a view-through case with strap, a soft storage case, along with eyepiece and objective covers. The cases, strap, and lens covers are all quite excellent in build and quality, but the tripod, to put it bluntly, is utter crap. Since the glass has a standard 1/4–20 thread adapter port, though, you can use any tripod or window mount you prefer, and just shuffle the included one off to the back of your garage or storage closet. 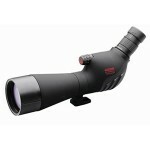 You’ll be able to zoom from 20X to 60X with either model, an excellent range of magnification. The three C’s, crispness, clarity, and contrast, are outstanding throughout the entire zoom range. The image isn’t quite HD-quality, but it’s pretty close. You’ll be just as comfortable viewing objects 20 feet away as you are subjects hundreds of yards in the distance. How Easy Are These Rampages To Use? The magnification and focus controls are pretty much right where you’d expect them to be on the two Rampages. Zoom is adjusted by twisting the eyepiece to the right or left, and you focus your image using a knob just forward of the top of the “knuckle” between the eyepiece and the maintube. Plenty of knurling is provided to give you a slip-free grip for adjusting the controls either with or without gloves on. How Sharp Is The Focus For These Scopes? The only thing I wish Redfield did differently here would be to provide both fine- and coarse-tuning focus controls. With that said, it doesn’t take long to get your image in perfectly sharp focus. The minimum focus distance of 19.8 feet is pretty reasonable, and the 1mm to 3mm exit pupil allows for a strong image, even in low light conditions, to come through the objective lens for you to bring into a sharp sight picture that you’ll love viewing. Do Redfield Rampages Have Good Optics? Redfield’s optics are fully multicoated with phase correction coatings applied to the prism glass to prevent phase shift. The same attention to detail is spent on Redfield scopes as on their more expensive Leupold cousins. What’s The Body Like On A Redfield Spotting Scope? Most spotting scopes are constructed with metal housings coated in a rubberized armor, but that’s not the case with the Redfield Rampage. Instead, every model is made of the same stuff as bulletproof glass, polycarbonate. This means an exceptionally light body that is still remarkably tough. The tripod ring allows you to mount your glass to any standard tripod or window mount, so you can fit your optic exactly where you need it. A retractable sunshade is an added bonus, helping ensure you get a terrific sight picture regardless of the lighting conditions. Can I Use These Optics For Astronomy? Thanks to generously sized objective lenses and fully multicoated optics, these spotting scopes are quite useful even in low-light conditions. I’ve used both Rampages for backyard astronomy, enjoying gorgeous views of the surface of the moon as well as Jupiter and Saturn. Not only is the polycarbonate body darned near bulletproof, but the lenses are O-ring sealed and the optics chamber nitrogen-purged. 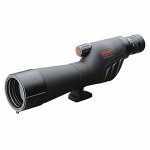 This provides you with a spotting scope that is shockproof, waterproof, and even fogproof. You’ll be able to use your Rampage in just about any weather conditions without worries of damage or poor views. Thanks for reading up on the Redfield Rampage line of spotting scopes. Even though these optics are budget-friendly, they still rival the best models in the industry. They’re not absolutely perfect, but you still can’t really go wrong with a Redfield Rampage. The only reason, honestly, to go with a more expensive variant would be for the HD quality provided by extra low dispersion glass.